As the NHL All-Star Weekend approaches, I think it’s time for a little Kumbaya about the Boston Bruins and their season. Okay, technically we’re more than halfway through the season you math sticklers, but the team is on their “bye” week and won’t play their next game until the end of January. The Bruins are 27-17-5 on the season, although they are currently the first wild-card team. It has been more of the same with this Bruins team as last year where a majority of their production comes from the almighty top line of Patrice Bergeron, David Pastrnak, and friendly neighborhood Brad Marchand along with their dominant power-play unit. The team currently ranks 17th in the league in goals scored per game with 2.90/game and arguably one of the best power-play units with a unit that is scoring at a 27.2% clip which ranks 2nd in the league. The area that they have truly shined is goals allowed per game where they have given up a measly 2.61 goals/game which is only behind the New York Islanders and Nashville Predators for the league’s lowest goals allowed per game. The Bruins, despite injuries to key players, have pieced together a solid team outside of the top line and have brought a strong work ethic to each game in front of head coach Bruce Cassidy. So how exactly did the team get to 27-17-5 and where is this team headed? Let’s dive in. The Bruins have had an up-and-down offense throughout the season and have had stretches where they were unstoppable and then other stretches where they couldn’t find twine if both nets were empty. The one constant has inevitably been the top line of Pastrnak, Marchand, and Bergeron, who have combined for 150 points over 49 games. This top-heavy approach has worked so far during the regular season, but there must be contributions from other lines for this team to be considered a serious threat should they find themselves in the playoffs (I fully expect them to be there come April). David Krejci’s season has been revitalized thanks to his impressive run from December 1st to the team’s bye week with 21 points (8 goals, 13 assists) in 24 games. His linemates have been juggled around due to injuries or Cassidy simply trying to find chemistry between a young wing and his veteran center. From breaking up the “God line” and putting Krejci with Pastrnak or putting Krejci with a Providence Bruins journeyman like Peter Cehlarik, all lines outside of the first one are not concrete. As for the third and fourth lines, the team has received surprising contributions from second-year Bruin Sean Kuraly with 14 points (6 goals, 8 assists) in 48 games. That isn’t anything to sniff at, but Kuraly has been a significant piece on the Bruins penalty-kill and has been averaging about 15 minutes of time-on-ice (TOI) during the month of January (compared to 13 minutes of TOI for the whole season). Outside of Kuraly, these lines have been shuffled around quite a bit and although there have been sparks here and there from players such as David Backes, Danton Heinen, Chris Wagner, and Jakob Forsbacka Karlsson, consistency is certainly something to be desired from this group. With the departure of backup Anton Khudobin over the offseason, the Boston Bruins brought in longtime New York Islanders goalie Jaroslav Halak to backup Tukkaa Rask in net. For a long stretch at the beginning of the season, Halak was seriously challenging Rask for the starting role as he had been struggling early on. Since then, Rask has pulled himself together after a brief leave of absence from the team in November. It doesn’t get more identical than the numbers presented, although Rask and Halak have taken different paths to get to this point with Halak having stretches of greatness when Rask was struggling and vice versa. 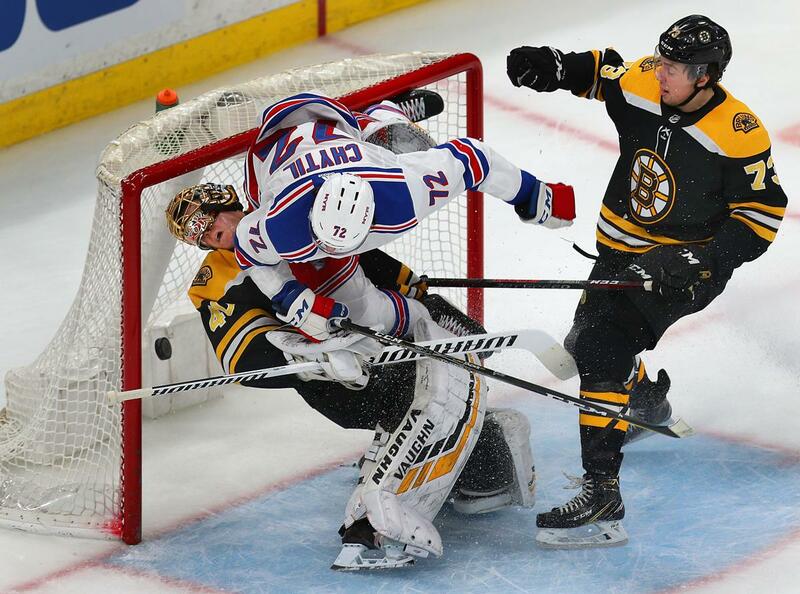 Ultimately, Rask is still the man in net and despite a recent concussion suffered during the team’s game versus the New York Rangers, he should be good-to-go once the team resumes play against the Winnipeg Jets on January 29th. This team feels more like a playoff team than a bubble team even though they currently own the first wild-card spot in the Eastern Conference. It will be interesting to see how aggressive Bruins’ General Manager Don Sweeney will be in pursuit of the team’s needs heading towards the trade deadline on February 25th. The team will most likely be in pursuit of a top-six winger to be paired up on the second line with David Krejci. NBC Sports Boston’s Joe Haggerty had outlined recently that the Bruins and St. Louis Blues could be in talks of a potential trade involving the Blues’ Brayden Schenn or Vladimir Tarasenko. Schenn currently has 27 points and Tarasenko has 32 points over the 2018-2019 season and although Tarasenko would provide more upside from a scoring standpoint, either would be a significant lift to the team. Regardless if this team makes any moves or stays flat before the deadline, the team will still have a tough road of ahead of them heading into the final third of the season. They will have matchups against some of the top teams in the league including the New York Islanders, Tampa Bay Lightning, San Jose Sharks, and Washington Capitals. These teams will undoubtedly be a strong test and measuring stick for this team. If the team is able to acquire a top-six winger (and maybe another defenseman), then that should allow for other members on the team to better fit in their roles on the team, instead of relying on younger third and fourth line players to assume more responsibility and ice time. The Bruins should be able to secure, at the minimum, a wild-card spot for the 2019 Stanley Cup Playoffs unless there is a disastrous downturn in the team’s play. From there, it may take a flaming hot run for this team to compete for another Stanley Cup, but we’ll worry about that in a few months.